I recently interviewed elementary school teacher Judy Therrien on my Cardboard Box Adventures Radio Show. Judy has worked in public school education for over 50 years and for the past 40 years, she has focused on teaching reading to young children with reading problems, especially those related to dyslexia. In teaching these students she observed some fascinating facts about how young students who are challenged with mixed-hand dominance issues can learn to read more fluently. What are mixed-hand dominance issues and how can this impact reading fluency? Judy shared the results of her work with me on my radio show and she has also graciously agreed to be interviewed for this blog. Don: When did you get your start as an elementary school teacher? And why did you decide to specialize in helping struggling readers? Judy: I started teaching 2nd grade in Eastern MA at age 21, just a few months after graduating from SC in elementary education in 1964 where MLK Jr. was our commencement speaker. I guess that really dates me! Only 5 years later I decided to major in helping youngsters with really challenging issues in reading. And I learned that children do not have to have a life full of reading challenges if, if, if they get the right guidance when young! Don: What observations did you make early on and how has this influenced the way you approach teaching? Judy: In my 5th year of teaching, I became an informal dyslexia specialist in a Lexington, MA public school. More than ¾ of the students in my small second grade class had what we called dyslexia, but what I now like to call mixed-hand dominance, to distinguish it from dyslexia. Don: What is mixed-hand dominance? Judy: Mixed-hand dominance is exactly what it says; a person can be about half right handed, or any fraction of right and left handed. This causes great problems in reading, because written words march across the page in only one direction. How can we tell which hand is dominant? I found out that even Kindergarten students hold a pencil and write with one specific hand, and I tell the students that this is their favorite hand, and the one they must use when “tracking” or flowing a finger under the words they read. Don: You made a fairly recent discovery concerning hand dominance; can you describe that for us? Judy: Yes. After working with first or second-grade students in a group or small classes for years and years in the Monterey, CA, public schools, 3 years ago I noticed that if they were tracking with their dominant hand, their reading was going well. But if the students started using their other hand to dog ear the corner of the page, or scratch their head, or pick up something on the desk or table, the word they were reading could be reversed; such as the word saw substituted for the word was; the word no instead of on, and stop taking the place of spot. I was shocked, and knew that the wrong hemisphere of the brain was vying to be the master of their reading! With most western language, we read from left to right. In every single culture in the world, reading goes from one direction to the other and doesn’t change in the middle of sentences, ever. But children with mixed-hand dominance can try to read in either direction, often reversing the direction in which they are reading, before being guided to go from left to right. You might have noticed that the letters b and d are often reversed in young students because of this. Don: From your observation, how much of an influence does mixed hand dominance have on reading? Judy: Huge! I discovered that students must keep their non-dominant hand quiet and rest it while tracking and flowing under the words they are reading with their dominant hand. It is not good for teachers and specialists to let their students play with things like fidget spinners and other toys with their non-dominant hand when reading and tracking with the dominant hand. The brain needs to learn to read in one direction only and we as teachers are the ones to facilitate their efforts to become good readers, not having the brain get mixed messages about the directions words travel on the printed page. Don: How did you help put self-conscious “slow” or dyslexic readers at ease in your classroom and help them gain confidence? Judy: My groups are small. There are 7-12 students in each and we sit in a half circle so I can see every student and be sure they are using their dominant hand to read and resting their other hand with the sequential reading material. I try to make reading fun! And these first graders get tons of practice, which is so important. When one student reads, all the other students are tracking, flowing their finger under the words, and since they are all about on the same level, they are all practicing reading “in their heads” when their friends are reading. Their confidence grows when its pointed out to them how much progress they’ve made! They often pat themselves on the back! It’s easy to see progress as the reading books we use when they begin learning to read are sequentially based—for example, they read 3 letter words with a short “a” in them, and then stories with these words in them. The next short vowel they learn is a short u, used with consonants in 3 letter words, and then they read stories that have the short a and the short u. Reading can be easy when using a program that is based on sequential learning because it’s easy for them to see how far they have progressed! Amazing! Don: What have you found to be the most important things to address with dyslexic students? Judy: Like with all early reading students, it is so important that the sounds of our letters are taught correctly! So often, teachers and specialists teach that b says buh, c says cuh, d says duh… but do consonants really sound like a combination of a consonant with a vowel sound? No. Here is an example I’d like to share—I was working with one little student at school a few years ago, and she read the word bat like this; buh-a-tuh. Why? Because she was taught that b says buh, c says cuh, d says duh, t says tuh, etc. But just as I learned in college in my teaching early reading class, all consonants are obstructed sounds! They don’t COME with vowels when they are alone! In a short 3-letter word, with the letter a they say ba, ca, da, fa, etc; when paired with an i, in the middle of a 3 letter word, they say bi, di, fi, hi, li mi, etc. We must be sure that when we teach consonants, we show that each one sounds different when combined with different vowels! In our groups we read “ba, as in bat, ca as in cat,” etc., and later, “bi as in bit, di as in did, fi as in fin,” etc. Don: Do you find it necessary to help students be patient with themselves? How do you do this? How do you deal with student negativity, such as them saying, “I can’t do this,” “I’ll never get it right,” etc.? Judy: I have never seen this, as the first or second-grade reading program I use is based on the sequence I mentioned. When with me, they never read words that are too hard for them. But I have seen this when a teacher uses reading material that is too difficult and the youngsters don’t know the sounds. It’s common, unfortunately. 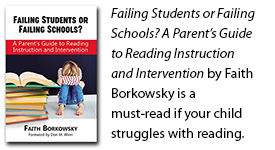 When a parent reads to a child, with the student tracking and flowing the finger under the words, the student can read the easy words slowly, and the adult reads the difficult words, breaking them into syllables, so the student can understand the word structure. Don: What kinds of books appeal most to reluctant readers? What kind of books do we need to see more of to address the needs of dyslexic/reluctant readers? Judy: Your books, for example, once the student has mastered sequential early reading training and is ready to move on. Books like these are meant to catch their interests and that is the key to the love of reading. Listeners to the program can order them on your web site www.donwinn.com. Also, be sure your readers have library cards and can choose beginning books that attract their interest. Don: What message would you like to convey to parents and other teachers? Judy: Reading can be fun for all and it opens minds to the whole world. Reading is the key to everything. But for those young students with mixed-hand dominance, please be sure practicing goes along with tracking or flowing the finger with the dominant hand, under the word from left to right. You can tell which one is the dominant hand, because the student will use that hand to write. Please be sure that the non-dominant hand is resting and not moving at all so that only one hemisphere of the brain is working at a time, and not trying to reverse letters or words. Know that if this is followed, reading can be a very highly enjoyable activity…for life! Don: I’d like to thank Judy Therrien for taking the time to be interviewed and for her passion for helping struggling young readers learn to read. Judy’s work and observations teach us that even if we’ve been in a field for 50 years, we can still make discoveries—even life-changing discoveries! By keeping our eyes open, being curious, and approaching each struggling reader as a unique individual, we can make greater strides against the many challenges to literacy. I’d love to hear your thoughts, readers, on whether you have observed mixed-hand dominance issues as they pertain to your child’s reading challenges. If you’re looking for a series of exciting adventure books to engage reluctant readers, take a peek at the award-winning Sir Kaye series published by Progressive Rising Phoenix Press. Thank you, Don, for this inspring post! The interview with Judy has provided us with great insight into understanding why young children with dyslexia sometimes faced reading and writing challenges because of the mixed-hand dominance issue. This observation is really new to us, and we believe it would benefit parents and educators who want to make a positive impact for our younger dyslexic! My Child is No Shame is a social campaign aiming to create awareness on Dyslexia to our local community and break the connection between Dyslexia and shame! We are proud to share how dyslexics are creative individuals, and it is important to build an inclusive society where our young children with dyslexia would grow up healthy and remain passionate about learning! We certainly hope you could share your success story with us as an inspiration to our readers! Hi JQ, I’m glad you found this blog helpful. I’ll also be happy to share my story with your readers. Much appreciated, Don! I’ll drop you an email shortly.